Methods Machine Tools, Inc., North America’s foremost supplier of leading-edge precision machine tools and automation, will be featuring the Nakamura-Tome SC-300IIMYB Multitasking Turning Center in Booth 339119 at IMTS (International Manufacturing Technology Show), located in the South Hall of McCormick Place, Chicago, Illinois from September 10-15, 2018. 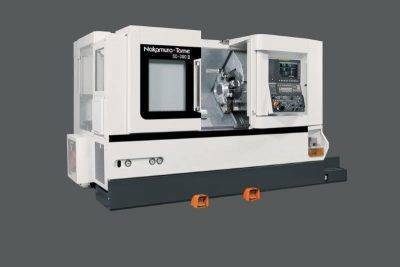 The Nakamura-Tome SC-300IIMYB has an extremely rugged machine structure with a massive 45-degree slant bed and box-way slides on all axes, providing the rigidity required to machine difficult, high-hardness materials with extremely high accuracy. The Nakamura SC-300IIMYB features a 3,500 rpm main spindle with a 3.5″ (89 mm) bar capacity. A large 4.7″ (120 mm) Y-axis travel and 10HP milling function offers increased capacity, enabling fast machining with a cutting depth of .35″ (9 mm). A 30/25 HP wide-range motor facilitates powerful cuts. Extremely rigid, the turret holds 12 driven or 24 stationary tools. The SC-300IIMYB is an environmentally friendly, energy-saving machine featuring a compact design with machine dimensions of 157.3″ (3,995 mm) length x 83.6″ (2,130 mm) width x 90.5″ (2,300 mm) height. The Multitasking Turning Center weighs 19,840 lbs. (9,000 kg). The Nakamura SC-300IIMYB features a 15″ high-resolution color display LCD panel, which works in conjunction with the latest Fanuc 0i-TF control to give a high degree of functionality, coupled with fast processing speeds and 1,280m of part program storage length. The SC-300IIMYB comes equipped with the NT Work Navigator that can recognize the coordinates of machine parts with non-round shapes such as those in forgings and castings, without any additional costs involved. This cost-cutting feature eliminates the need for costly positioning fixtures and clamping devices. In addition, the Advanced NT Nurse System all-in-one software package is included. This software provides convenient, easily operated support for the operation, programming and production on the machine. Critical functionality includes phase recognition (key for multitasking), direct chucking enabling transfer without positioning error, and precise synchronization of the left/ right-hand spindles. Additional functions include a load monitor for identifying tool wear/ breakage, tool life management and operation condition monitoring. All Nakamura-Tome machines are equipped with an “airbag” ‒ a standard safety feature that greatly reduces the impact and force of a machine collision. Should a crash occur, within 4 milliseconds after the crash, servo motor-feeding direction is reversed and the machine will stop in EMG mode.